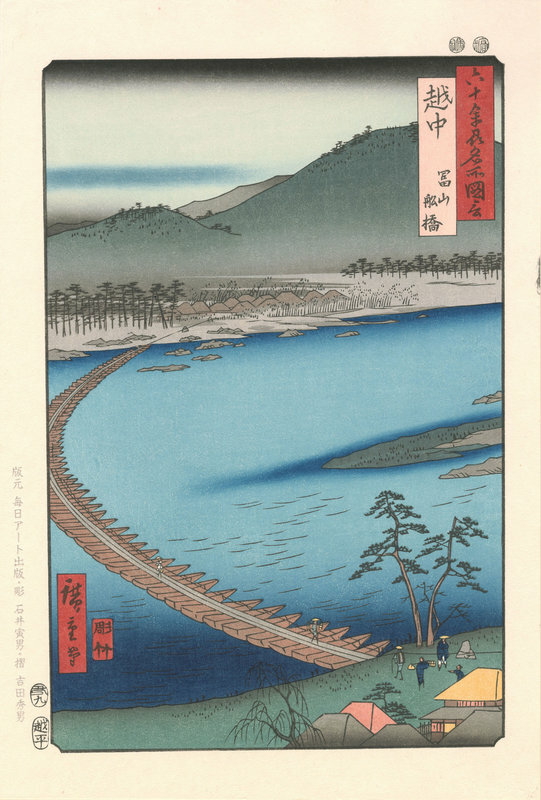 Hiroshige 1, Utagawa (1797-1858) "The Bridge of Boats at Toyama in Etchu Province" - Woodblock - Chinese and Japanese woodblock prints for sale, silkscreen, scrolls, watercolor, lithographs. Artwork Details for Hiroshige 1, Utagawa (1797-1858) "The Bridge of Boats at Toyama in Etchu Province"
Notes: While woodblock print reproductions of Hiroshige's most famous series "The Fifty-Three Stations of the Tokaido (Hoeido edition)" are very common, reproductions of his lesser-known series like "The One-Hundred Views of Famous Places in Edo" and this series, "Famous Views of the 60-odd Provinces", are exceedingly rare. I only know of two posthumous editions of Famous Views of the 60-odd Provinces: an edition of 300 published in 1978 (the edition shown here, being edition 72/300), and a more recent edition of 120 sets dating to 2001 that sold for about $9,000 here in Japan (please see here for details of the 2001 edition). Both editions were published by Mainichi Art Publishing and are sold out. Adachi did the printing and carving for this 1978 edition. This print is from a full album set. You can see all the prints in the series here. Notes: This series consists of sixty-nine different designs of each of the sixty-six provinces of Japan, the two major islands, the city of Edo and a title page.